The 3rd Electric Vehicle Summit was held last February 27-28, 2014. It was hosted by Meralco and featured presentations and discussion on the many issues regarding electric vehicle promotion and deployment in the Philippines. Outside the venue of the more formal presentations was an exhibit of the various electric vehicles that are currently available and being promoted by various proponents and companies. These include 2, 3 and 4-wheelers that can be used for either private or public transport. I observed that there are definitely a lot of improvements since the last exhibition in the previous EV Summit in 2012. Vehicle designs have evolved and for the better. Local manufacturers or companies have partnered with foreign companies who have more experience in EVs so its a good thing. They will definitely learn a lot from their partners and we cannot over-emphasize the importance of technology transfer particularly in areas or aspects where local manufacturers are weak like the controller and the motor. The COMET, which is being proposed as a replacement for the conventional jeepneys. More 3-wheelers and an electric car from the same company that brought us the EVs at Bonifacio Global City that are nearing extinction. Another tuktuk design 3-wheeler – this one looks very much like the EVs in operation at BGC in Taguig. Many companies were supposed to have submitted bids to the DOE-ADB initiative to push for electric tricycles. There are still no assurances whether these e-trikes will replace conventional ones currently dominating transport in many cities and municipalities around the country. Another electric 4-wheeler. These still look more like glamorized golf carts than the sleek electric cars currently in the market that includes the popular but expensive Tesla. The newest model of the e-jeepney from PhUV, the first to manufacture local electric jeepneys including the models now running in Makati, Pasig and Quezon City. I learned that they have partnered with TECO, a Taiwanese company that has extensive experience in EVs. Notice the passenger door is already at the right side of the vehicle instead of the rear. Participants to the EV summit tried out the different EVs on display and for demo rides. The latest model e-jeepney was quite popular especially to foreign participants. Charging station developed by the same company – I think they’re trying to appeal to the “tingi” mentality of Filipinos by indicating PhP 10/15 minutes of charge. Perhaps one of if not the best e-trike that was on display was this model by Japanese manufacturers. They were supposed to have been selected by DOE and ADB for the first phase of the e-trike project that will see the deployment of 5,000+ e-trikes in different Philippine cities. Mitsubishi featured its elective Outlander, which, I observed, got more attention from the well-heeled participants. Students on field trips for the exhibit were not into this example of the more refined EV models. Another tuktuk 3-wheeler design from Prozza. 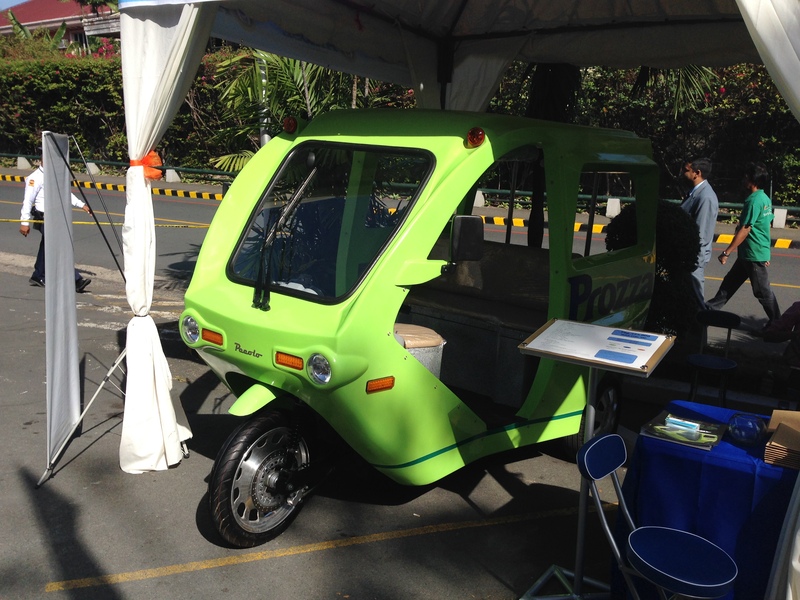 I don’t really remember all the participating exhibitors but most of them bid for the e-trike project of the DOE-ADB. The same 6-seater e-trike from Prozza in green body color. I would defer from a quick assessment of these EVs to another post. For now, I just like to show the models that were shown in the recent summit. Suffice it to say that I have high hopes for EVs in the Philippines but then we need to really look into the context for these vehicles as well as the sustainability given the challenges of power generation for many areas in the country. By d0ctrine in Electric Vehicles, EST on March 7, 2014 . Is the 6 seater e trike green body already available in the market?